Summary: The antibody developer had already said this statement would reveal bumper results, but the figures were still better than I had expected. Although progress was helped by post-Brexit currency movements, it was clear the underlying business delivered yet another robust performance. The financials remain extremely impressive, with the second-half operating margin hitting an incredible 80%. The icing on the cake was management underpinning its confidence with the declaration of a welcome £1m special dividend. I continue to hold. A positive trading update during August had already prepared investors for a bumper set of figures. In the event, the results were better than my expectations and I believe better than the expectations of most other observers as well. The annual dividend also marched higher — up 30% — with the second interim payout up 20% to 26p per share. A bonus was the declaration of a special payout of 20p per share — equivalent to £1m. H2 revenue and profit surged 31% and 38% respectively, due in part to favourable post-Brexit exchange rates. About 95% of revenue was earned from overseas customers during the year, and last week’s statement confirmed BVXP receives its antibody royalties around two months after each half year. As such, royalties earned between January and June (H2) were in fact converted during August at post-Brexit exchange rates of £1:$1.30 and £1:€1.20. My rough sums indicate post-Brexit currency movements added about £200k to revenue and — with costs predominantly staff wages paid in sterling — the entire gain probably fell straight through to profit. Anyway, BVXP confirmed it does not employ any currency hedges and so sterling’s recent weakness should also enhance the firm’s forthcoming first-half performance. “As in recent years, much of the revenue growth has come from our vitamin D antibody (vitD3.5H10) in the form of increased physical antibody sales and royalties. BVXP did not use the word “modestly” when assessing the vitamin D product at this point last year, so I assume revenue growth related to this antibody will moderate during 2017. 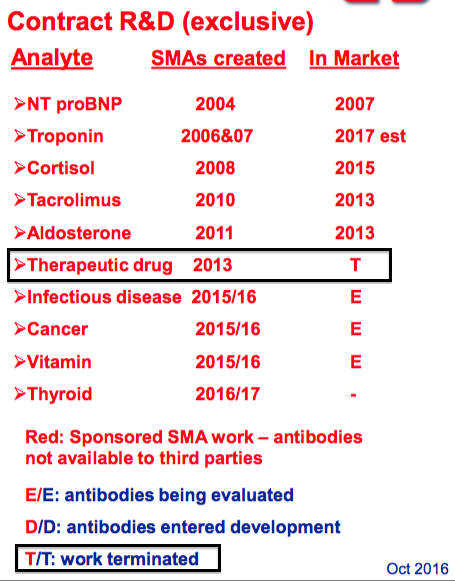 Other positive developments within these results included “material revenue” now being generated from a new antibody to androstenedione, and the first royalty contracts being agreed with Chinese companies. Also of note is chief exec Peter Harrison’s reference to the potential of BVXP’s new troponin antibody for Siemens. In particular, he continues to remain confident that the troponin product will offset the £700k – £800k of revenue that will be lost during 2017/2018 from another product. In fact, during an interview for the super piworld.co.uk website, Mr Harrison cited his house broker’s research that claimed the troponin product could eventually produce annual revenue of £2m for BVXP. In particular, the group’s operating margin has risen higher into the stratosphere — I calculate H2 profit represented an unbelievable 80% of revenue. 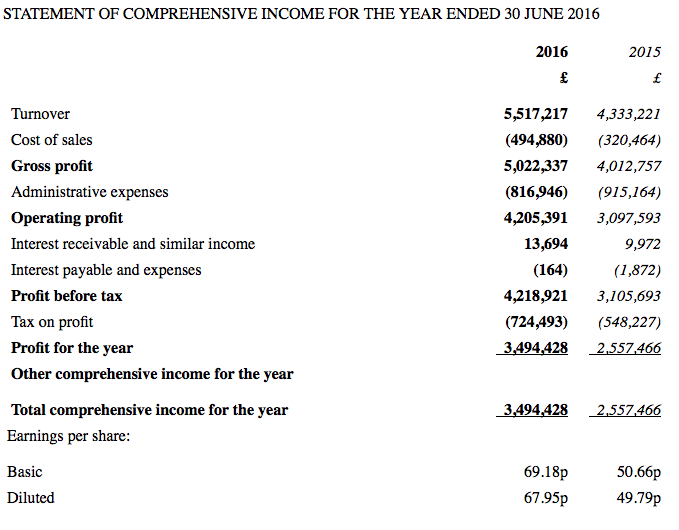 I can’t recall any other non-property company ever reporting such a phenomenal operating margin before. I calculate total capital expenditure has represented a minuscule 1.3% of BVXP’s aggregate operating profit during the last five years — and the £21k spent during 2016 was ludicrously tiny. Meanwhile, BVXP’s working-capital movements are somewhat larger — although absorbing a total £2m during the last five years does not ring alarm bells for me when operating profit has jumped from £1.5m to £4.2m throughout the same period. I doubt the 20p per share/£1m special dividend will impinge on BVXP’s “operational and strategic agility”. * Is BVXP itself being modest when it uses the term “modest”? “We are delighted to be able to report such positive news for the current year. Furthermore, we remain optimistic that further modest growth next year will come from additional vitamin D antibody sales and royalties. Beyond that, growth in the period 2017 2020 will be linked to our troponin project and the success of Siemens in their product launches around the world. “We are delighted to be able to report such positive news for the current year. Furthermore, we remain optimistic that further modest growth in the next two years will come from additional vitamin D antibody sales and royalties. Beyond that, growth in the period from 2017 to 2020 will be linked to the success of our troponin project. I will certainly take another year of “modest” 27% revenue growth! The 1,450p share price appears to expect a few more good years, too. Taking the reported £4,205k trailing operating profit, adjusting for the £76k foreign-exchange gain and taxing at a favourable 17% (BVXP enjoys R&D tax credits), I arrive at earnings of about £3.4m or approximately 67p per share. Subtract the 106p per share cash position from the 1,450p share price and my underlying trailing P/E comes to about 1,344p/67p = 20. Meanwhile, the 42.5p per share ordinary dividend supports an income of 2.9%. For now, I can only trust BVXP can extract a little more growth from its vitamin D antibody while successfully navigating that c£750k loss of revenue. Mind you, I feel the 1,450p share price could easily be justified if that new product for Siemens really does produce annual revenue of £2m. BVXP has previously identified US revenue with its 2015 and 2014 preliminary releases. Perhaps the forthcoming annual report will revert back to that standard. These accounts are unusual as they are presented in the ye olde UK GAAP format, which does not provide as much disclosure as the usual IFRS standard. As I understand things, AIM Rule 19 allows UK companies without subsidiaries (such as BVXP) to present their accounts using UK GAAP. UK businesses that are formed of a parent company plus one or more subsidiary operations have to present group accounts using IFRS. I noted in the Comment above that BVXP lumped its United States revenue with that from the Rest of the World. The group had previously identified US revenue separately. Generally speaking, growing companies ought to be giving investors more information — not less. That said, I can’t imagine BVXP has something to hide here. The workforce now numbers 14, and each bears a total cost of £47.3k to the group — last year the figure was £47.7k. Each employee on average generated a super £394k of revenue for 2016, up from £333k last year and £179k in 2011. Total employee costs represented just 12% of revenue. Aside from employees, BVXP’s other expenses totalled only £155k. I can envisage BVXP’s already stratospheric operating margin increasing even higher should the company be able to grow it revenue further and keep its employee team so small. 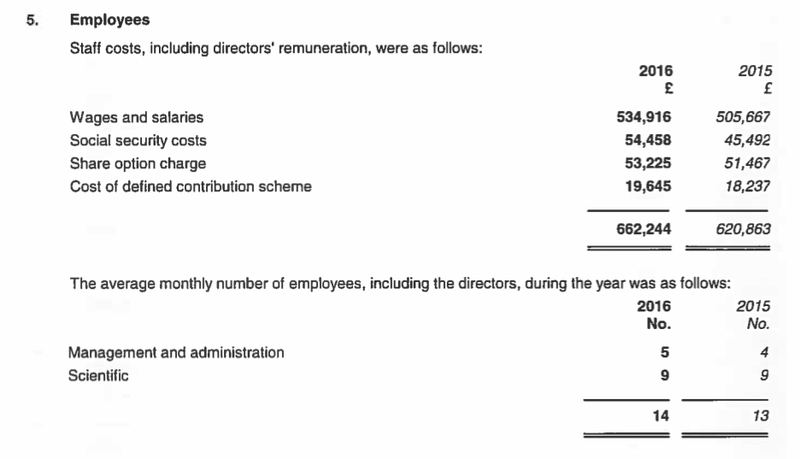 BVXP’s AIM admission document indicated chief executive Peter Harrison was on a £120k wage for 2014. I guess Mr Harrison may now be on about £130k, as the AIM admission document said the chairman was on £20k and another non-exec was on £17k. The third non-exec, the finance director, is paid indirectly by BVXP through her accountancy practice. It appears as if BVXP carries a lot of accrued income — which reflects revenue earned during the period but where the customer had not yet been invoiced at the balance-sheet date. It appears to me that BVXP’s customers inform BVXP of their global sales after the period end, and BVXP then invoices the customers for the appropriate royalty sum. As such, the revenue to be collected is deemed to be accrued income — i.e. the revenue had not been invoiced at the balance-sheet date. Anyway, the year-end prepayment and accrued income figure for 2016 is equivalent to 54% of royalty revenue, which compares to 54% for 2015 and 52% for 2014. So I am pleased the backlog of customer payments is not growing faster than royalty revenue.